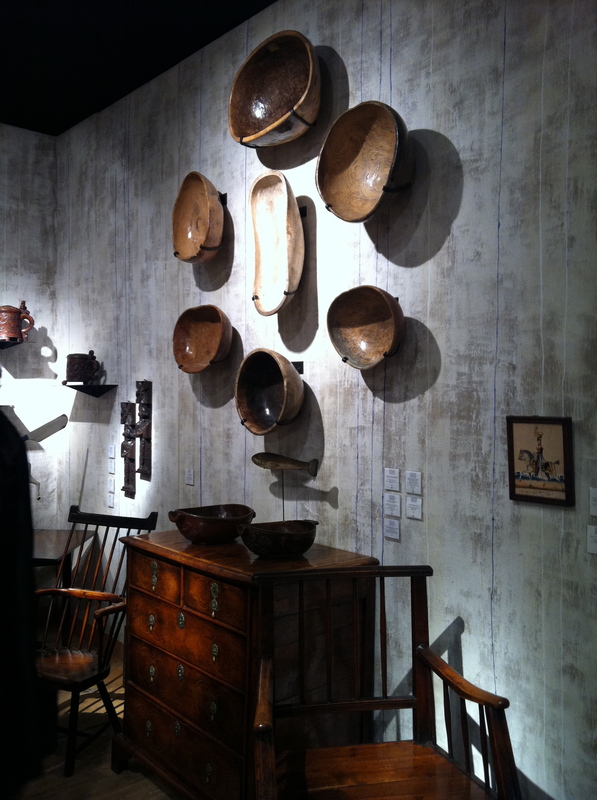 The 59th Annual Winter Antiques Show is currently running at the Park Avenue Armory in New York. 59 years! Quite an achievement, but then the antiques on view should be even older than that! Because I am in the antiques business my friends have been asking, “Do your kids like antiques? 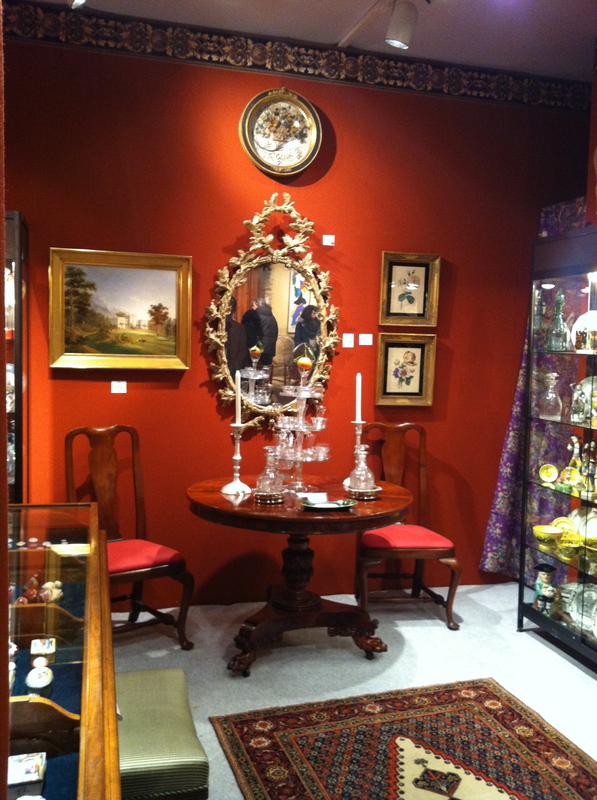 How is the antiques business? Does anyone buy antiques anymore?” Hmmm. 1. One of my children doesn’t care a whit for antiques, and the other wants ALL of mine when I depart the world – or before if I am generous enough! 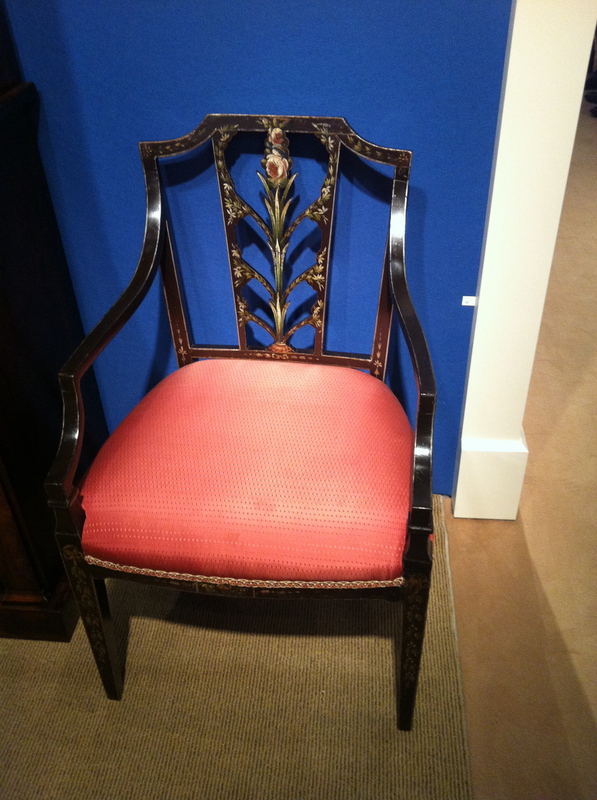 An appreciation for fine antiques can be developed over many years and disposable income is helpful. 2. From my viewpoint, the antiques business is alive, but a better economy will mean improved health for the business. 3. Yes, they are buying, but more importantly, they are still interested. That was in evidence with the crowd I witnessed yesterday at the show – literally got bumped into several times. On my first pass through, I pulled out my I Phone to snap anything that caught my fancy. This approach has led me to believe what I already know – I love country and I love city, I love high and I love low. In a previous post I told you I am always looking at chairs. I love this And I loved this! 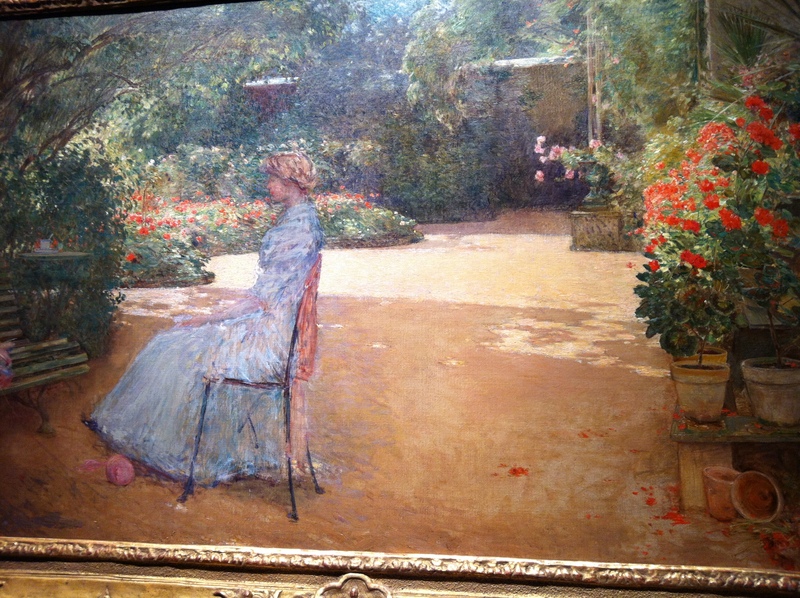 but I would also be happy with a Childe Hassam painting! If dear husband complained about insurance premiums rising, then I would be happy to take home this. I loved this mirror and oh! I like the reflected pieces as well! 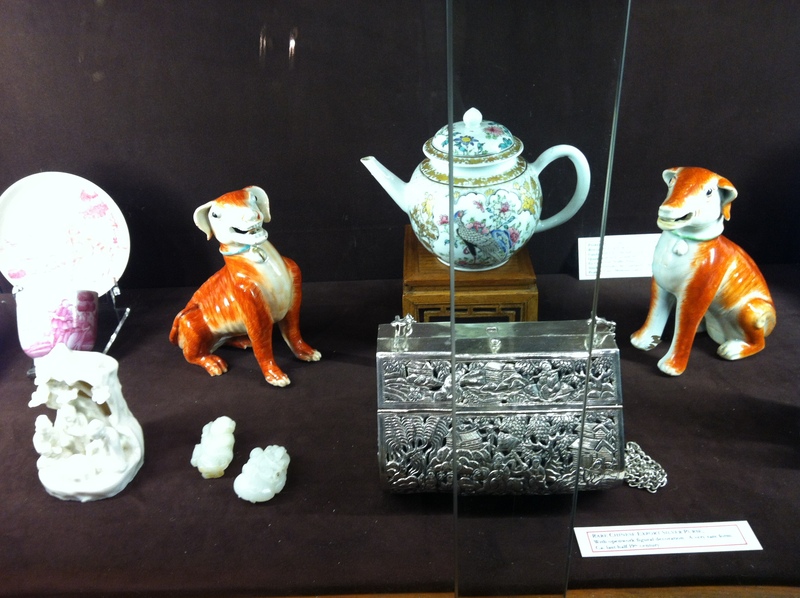 How about the Chinese garniture set on the beautiful lacquered cabinet! It pleases my eye, but not any more than these bowls! Have you seen the dough bowls sold by Tina at Enchanted Home? Could they end up on a wall someday? The craftsmanship and the skill of the maker is evident in each one of these and I wanted to touch them! 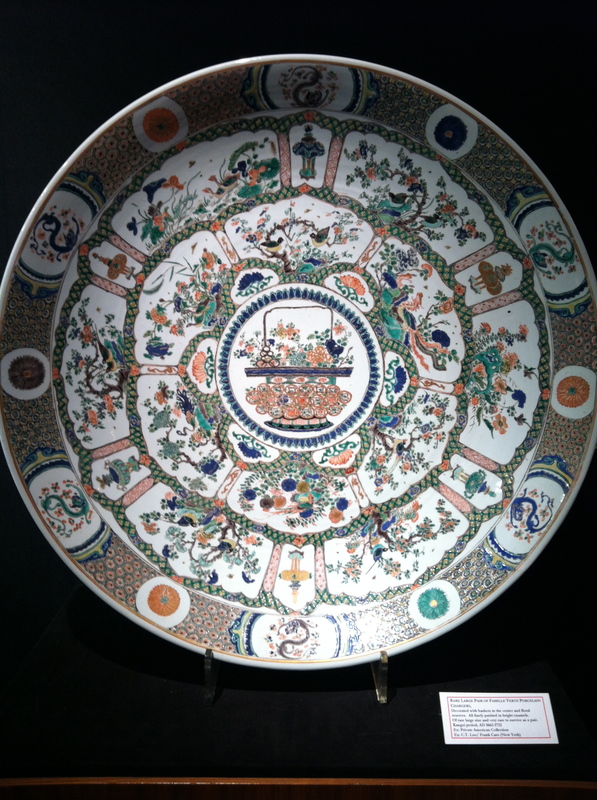 I am not all over the place about the Chinese porcelain. I’ve always desired a pair of hounds! Chinese famille verte charger! I’ll take two! Oh, you have a pair! (They did!) 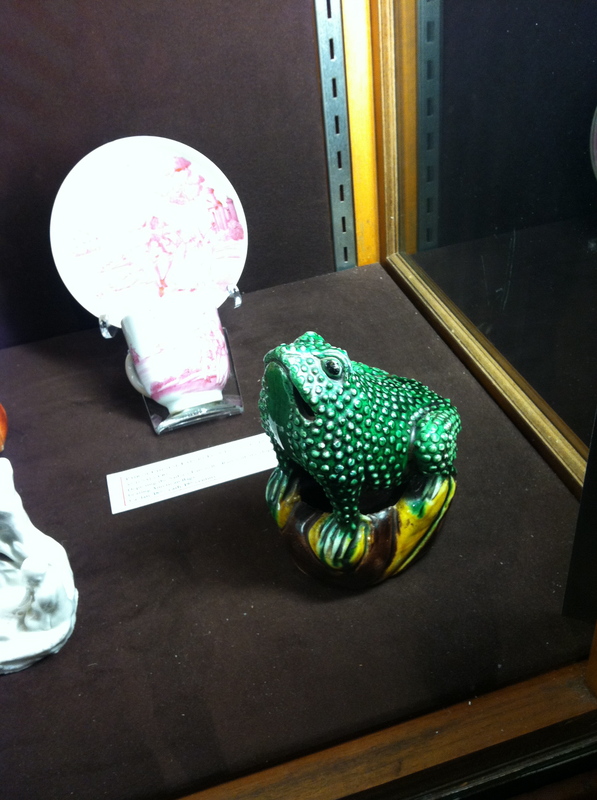 Dear toad, I could find a place for you, and take very good care of you during this century; how many have you seen? Pack up that wall! 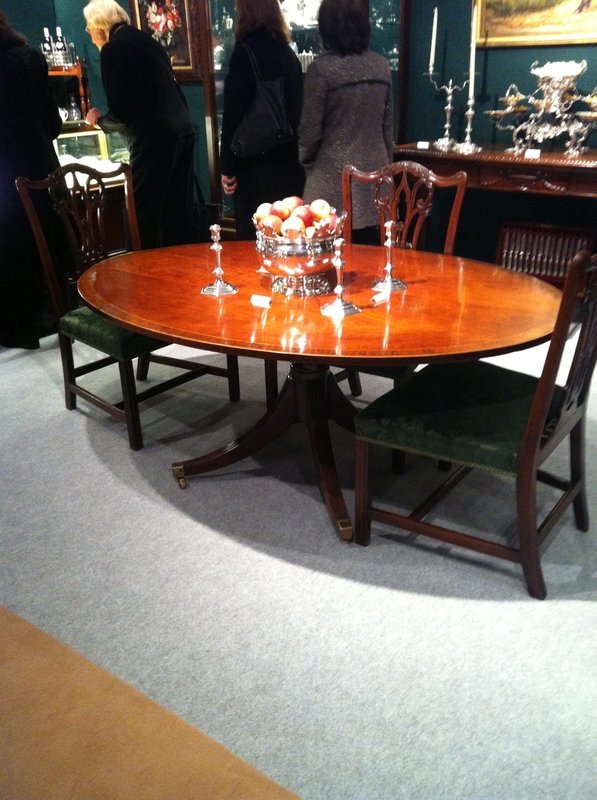 I’d like to dispose of my reproduction Queen Anne chairs, my round tea-table and replace with the originals, please! I’ll be happy with my own mirror, candlesticks and decanters if the tab is growing. 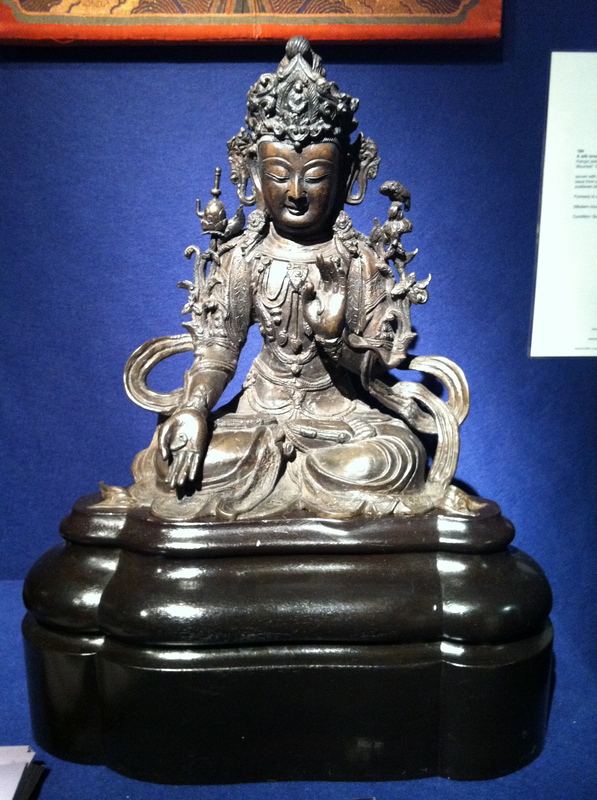 Oh, you can’t start a tab at the Winter Antiques show? My Mother might like this small dining table for her new spot at the retirement home; oh, she is trying to downsize…almost forgot. Needless to say, none of us NEEDS any of this STUFF, this old stuff we call ANTIQUES. But since the beginning of man, there has been a need to make STUFF with our two hands. And the best of the best survives. Hand made pieces and art works being made today, if they are the best of the best, will survive us. That is why I am asking my sister to handcraft another baby quilt for a dear friend’s new grand baby. I think it will deserve to be elevated to the world of “antiques” someday! 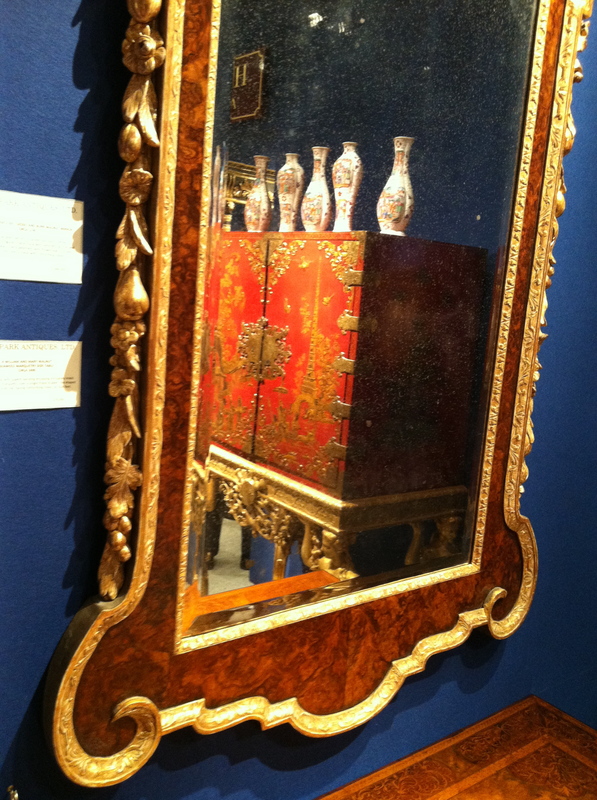 This entry was posted in Uncategorized and tagged 59th annual Winter Antiques show, antique mirror, baby quilt, Childe Hassam, Chinese porcelain. Bookmark the permalink. I just love antiques, but some of my favorite places to shop for them are shutting down. I think it does have to do with the economy. I wish and hope the newer generation will fall in love with antiques, too. They have so much character, history, and quality that is not seen in newer production pieces. Greetings. What a lovely surprise to find you had visited my blog and left a few words for me. Thank you. 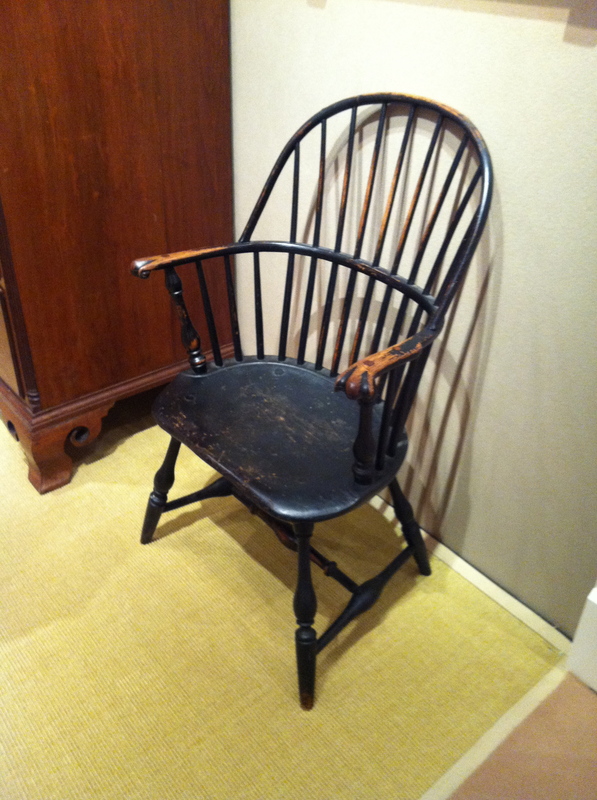 Interesting post about antiques and lovely pictures… I like the old Windsor chair, I could easily find a nice little corner for that. 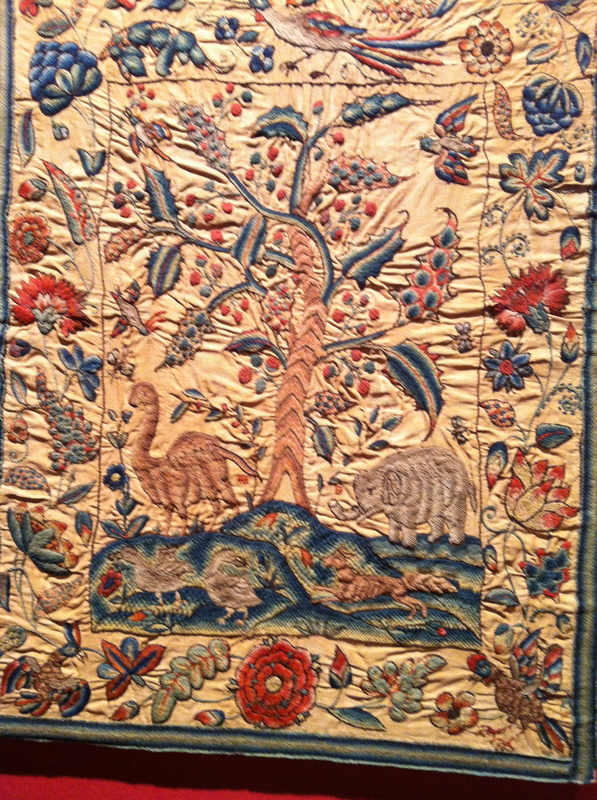 really enjoyed the antique tour – so many beautiful things! 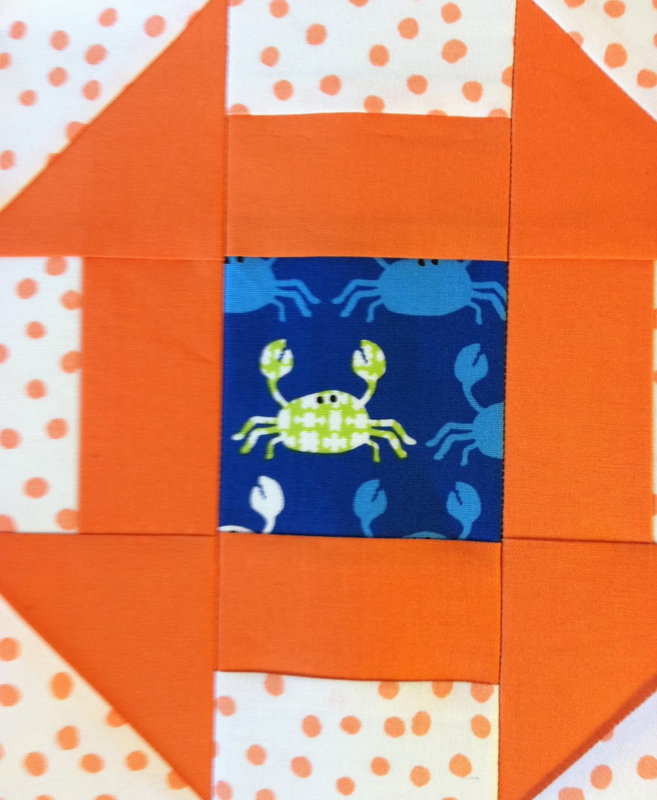 I am honored that my homely little quilt joined the ranks!